In the years between 1920 and 1950, medical researchers began to identify and document the importance of nutrition to good health, identifying certain conditions as being caused solely by dietary deficiencies of a single nutritional component, vitamins. As a result the science of nutrition was born. As researchers continued their investigation into the realm of nutrition, they found an ever increasing degree of complexity. In 1920, there were three known essential dietary vitamins and minerals. By 1930, that number had grown to 12. By 1950, there were 20 such elements considered to be essential dietary vitamins and minerals and research was beginning to show the important roles of other dietary factors. Special dietary fats known as lipids and sterols were discovered to influence nutrition at the cellular level. Other nutritional factors, including enzymes, proteins, amino acids and a group of nutrients known by names such as “unidentified growth factors” all began to contribute to the human nutrition puzzle. It became clear that vitamins and minerals alone were not the answer. Through a combination of science and nutritional insight, our Formula IV Food Supplement became available to a health conscious society. Containing vitamins and minerals, lipids and sterols, protein, selected enzymes and a complex array of other naturally derived dietary nutrients it represented a giant leap toward optimum dietary intake with the help of supplementation. 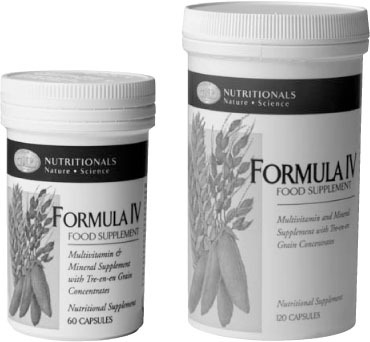 Formula IV Food Supplement differs from other nutrition supplements in that it is not just a “multi-vitamin”. It is a unique food supplement combining vitamins, minerals, protein, selected enzymes and lipids/sterols in a food concentrate formula. It is frequently imitated, but has never been successfully copied. This is due to GNLD’s exclusive use of Tre-en-en Grain Concentrates. Tre-en-en is a combination of grain concentrates derived by special methods of extraction from whole wheat berries, as well as from rice bran, soybeans and safflowers. It includes not just wheat germ oil or soy oil, but everything naturally available from the lipid (fatty) portion of whole grains. To these highly nutritious grain concentrates are added other naturally occurring food concentrates that provide essential vitamins, minerals, proteins and selected enzymes. 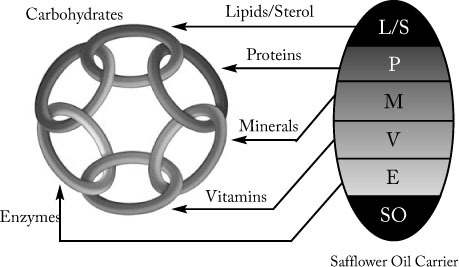 Six basic links join to form a complete chain of nutrients essential to the body’s efficient functioning: carbohydrates, lipids/sterols, proteins, minerals, vitamins and enzymes. GNLD refer to these nutrients as the “Chain of Life”. The goal of Formula IV Food Supplement is to supply five major links of the chain, excluding carbohydrates. Carbohydrates are generally present in every person’s diet, so they are not added to Formula IV Food Supplement. Compare Formula IV Food Supplement with the standard multi-vitamin/mineral preparation on the market. These contain isolated nutrients which address only a portion of the total chain and not a complete food that supports every link necessary to form a strong nutritional “Chain of Life”. Formula IV Food Supplement is produced under strict laboratory conditions with the same care of quality, purity and potency that has come to be expected of Golden Neo-Life Diamite International. No manufacturer goes to greater lengths to obtain premium naturally occurring source materials, to develop precisely balanced formulas or to maintain the highest level of quality control in manufacturing. No other product even approaches the naturally occurring whole food exclusive Tre-en-en Grain Concentrates. Contributes a well balanced nutritional base of vitamins, minerals, protein, selected enzymes and lipids and sterols to the daily diet. Serves as a solid foundation for building a programme of nutritional supplementation. More than just a multi-vitamin. A unique five factor formula with vitamins, minerals, lipids and sterols and selected enzymes. A complete food supplement based on Tre-en-en whole grain concentrate. Supports every link of the “Chain of Life” excluding only carbohydrates. Gelatine capsule breaks down quickly and completely ensuring maximum nutrient availability. Potency guaranteed. Good for two years after manufacture. Each capsule supplements the commonly present carbohydrates in the diet with other vital nutrients which are often deficient. Tre-en-en grain concentrate helps restore essential fatty acids commonly processed out of modern foods. A superior form of supplementation that can positively enhance the body’s general well-being.